Accommodation details – local hotels and B&B’s covering all price ranges. If the evening reception is being held at a hotel, negotiate reduced rates with the venue at the time of booking to make sure you and your guests get their most competitive rates. Directions – to the church or wedding venue and reception, plus a map and details of local train stations, airports and recommended taxi providers. Parking – include details of the parking arrangements at the ceremony and reception. Dress Code – If no reference is made to dress code on a formal invitation, then morning attire or suits should be worn by guests. If you wish for guests to attend in black tie, then this should be specifically mentioned. Wedding Lists – details of where guests can find your wedding list is one of the most asked questions. 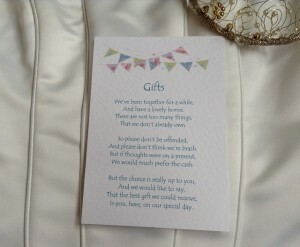 We’re also seeing a continuing increase in popularity of short poems advising guests that a gift of money is preferred, our wedding information cards are the perfect place to include this information. Close – advise your guests of the time the events will draw to a close – often referred to as ‘carriages’ – or when the bride and groom are ‘going away’. Contact Details – provide contact details for the person whom all questions should be directed to, remember in the interests of reducing stress on the run up to your big day that contact details don’t necessarily need to be the bride or groom. At Daisy Chain Invites we offer a wide range of Guest Information Cards to compliment your wedding stationery range.